Early issues of the newsletter were edited by the late Bruce Morris – and I think I got involved from about issue #6 (April 1991). Reading over the old newsletters has been fun and I think I might implement a new “Remember this?” feature in future issues. Look out for it in issue 51. Copies of all of our newsletters from number 23 (May 1998) are available on the FDNW website and over time we hope to make all the newsletters available in this way. The 2014 AGM of the Friends of the Dorothy Neal White Collection was held on Thursday 26 June at the National Library, Wellington. The evening began, as usual, with drinks & nibbles, followed by the presentation of the FDNW Research Grant to Dr Nicola Daly who is based at Waikato University. Nicola will use her grant to make research trips to Wellington to explore her topic “Pākehā- Māori: European-Native. Ethnic labelling in the Dorothy Neal White Collection”. She spoke of her excitement at looking at the selection of books from the DNW Collection she had already seen, and how much she was looking forward to spending more time with the collection during future visits. Nicola also spoke about the research she has done into “loan” words used in NZ books for children (for more details see p.2). At the AGM that followed Nicola’s presentation the current committee members were re-elected unopposed. As at the 2013 AGM we did not have anyone standing for the role of the committee president. It was agreed that we would continue as we have been doing with the responsibility for convening meetings and taking minutes being shared around the committee. When a spokesperson is required to comment on behalf of the Friends our Treasurer, Janet Blake, will continue to take that role. The committee had approached a well-known NZ author regarding the position of Patron but had not heard back at the time of the AGM. We have since heard that, while the author appreciated being approached, and would have liked to have taken the role, her personal circumstances mean that she felt unable to take on the position at this time. The committee will seek another Patron for the Society. It was agreed to retain the membership fee at $20:00 a year. Committee: Audrey Cooper, Barbara Robertson, Corrina Gordon, Mary Skarott, Tania Connolly. The FDNW Research Grant has been made to Dr Nicola Daly. 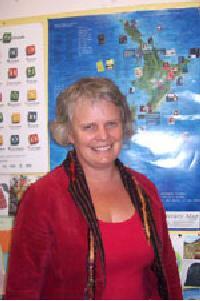 Nicola is a Senior Lecturer in Waikato University’s Faculty of Education. Her area of expertise is linguistics – specifically sociolinguistics, language teacher education, and Māori loanwords in New Zealand English children’s picture books. In 2011 Nicola launched a website featuring children’s picture books that reflect New Zealand’s national identity. The following article about the website was published on the University of Waikato website on 30 March 2011. Dr Nicola Daly: Recently launched a picture book website which she hopes will be a teaching resource for New Zealand schools. A Waikato University linguist has put together a New Zealand picture book collection that reflects New Zealand’s national identity. Dr Nicola Daly from the Faculty of Education has just launched a website called picturebooks.co.nz which she hopes will be used as a teaching resource in New Zealand schools. She got the idea from a similar European project based at the University of Roehampton in the UK. As well as developing the collection, Dr Daly has worked with Waikato postgraduate student and primary teacher Marion McKoy to develop activities that teachers can use in the classroom. That sent Dr Daly researching; first she studied picture books published by Huia between 1995 and 2005, then, with the help of a summer research scholarship recipient, she looked at 500 New Zealand picture books printed over the same period. The Huia publications had an average of 57 loan words per 1000 words of text. The more extensive collection had an average 13/1000 loan words. Dr Daly’s collection of 22 books has an average of 45/1000. “It’s the language in these books that is going to influence New Zealand English in years to come,” says Dr Daly. She also found, in discussion with parents, that they too were learning new words through reading to their children. Next she gathered together a group of children’s literature experts who met regularly over a three month period to negotiate a list of titles they felt should be included. The collection includes three Patricia Grace titles, single works from leading authors Joy Cowley, Margaret Mahy and Lynley Dodd and two from author illustrator Gavin Bishop. It was undeniably long, decidedly literary and it included not only an ample lunch but substantial morning and afternoon teas and pre-dinner drinks and nibbles! John and Ruth McIntyre’s ‘Day of Professional Development and Socialising’ held on Sunday 21 September at The Children’s Bookshop in Kilbirnie, was a milestone event at which representatives of the juvenile book trade in Wellington and central New Zealand and invited guests, were fed, informed and entertained for eight delightful hours! 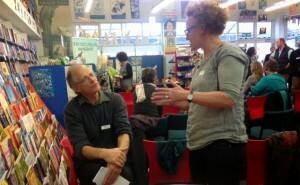 Authors, illustrators, editors, publishers and book designers, chatted with bookshop owners, publicists and book buyers. The mood was optimistic and the programme varied in its scope and full of interest. Presenters ranged from Vida and Luke Kelly from Kapiti, world class book designers, to novelist and freelance manuscript assessor and agent, Chris Else. Philippa Boyens MNZM, who co-authored the screenplay for The Lord of the Rings, King Kong, The Lovely Bones and The Hobbit, was the guest speaker. Two animated panel discussions, one about the prospect of real books in the digital age, the other on the fate of ‘your’ book after it arrives at the publisher’s warehouse, provided food for thought and plenty of laughs. Despite the ambitious scale of the event, Maureen Crisp of the Wellington Children’s Book Association and presenter of the semi-final session, advised the audience that, in October 2015, her organisation was planning a hui for writers and illustrators that would last for some three or four days, and involve an even wider number of topics and participants! Maureen called for suggestions with regards to prospective guest presenters and ideas for a tentative programme and received an enthusiastic response. 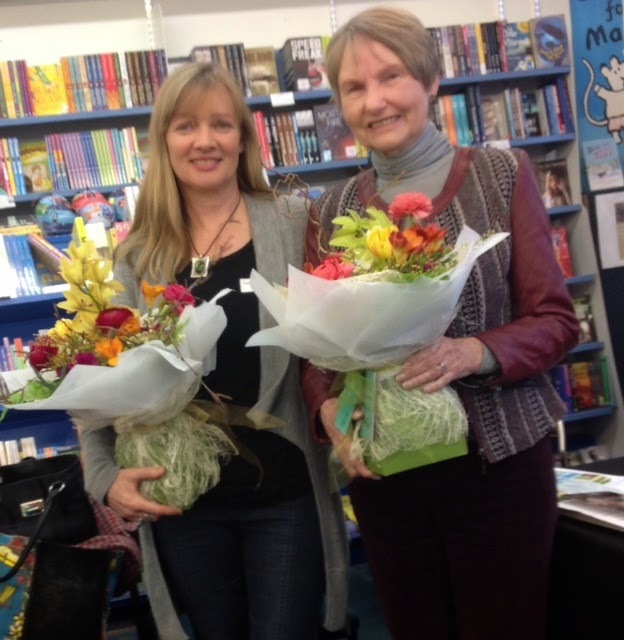 The Long Literary Lunch ended in celebratory mode with authors Fleur Beale and Anna Mackenzie launching each other’s young adult novels! I am Rebecca by Fleur Beale and Donnel’s Promise by Anna Mackenzie are both published by Random House, New Zealand. 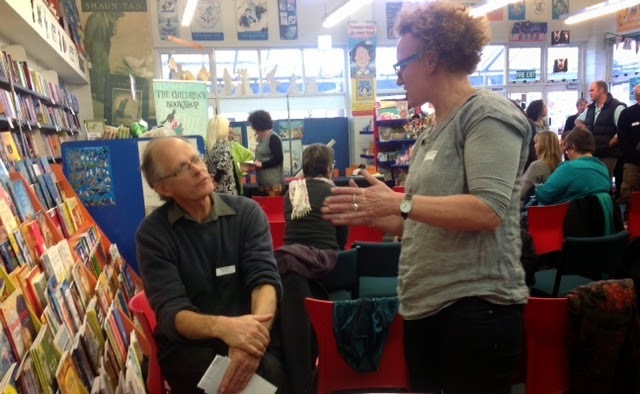 In June and July this year Barbara (FDNWC committee member) and Neil Robertson (both collectors of DNWC-type books) travelled on holiday to USA and UK, visiting relatives in Washington and Boston, friends in New York and Southern England, and attending a book conference in Bristol. In both New York and London, they were fortunate to encounter exhibitions of children’s books or authors. However, there were many other occasions when their book interests were indulged. We start the series by visiting Boston. 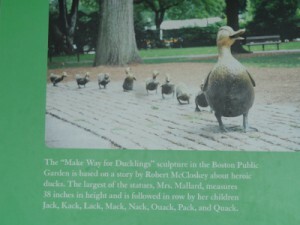 All over Boston there are copies of the book Make Way for Ducklings by Robert McCloskey. This is not surprising as the statue (by Nancy Schön) which was inspired by the story about the ducklings and their parents and their travels around Boston is a popular attraction in the Boston Public Gardens. 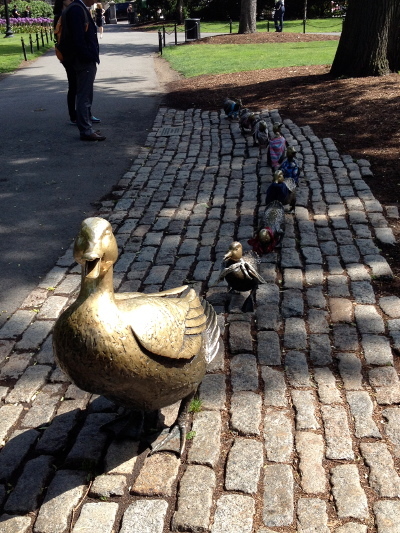 Children climb on the mother duck and the smaller ducklings, and many photographs are taken by parents and friends. In the Sky Walk at the top of the Prudential Center there is more information about the ducks, and there one learns (if you haven’t read the book) that the ducklings have names. They are Jack, Kack, Lack, Mack, Nack, Oack, Pack and Qack. Also in Boston, in the upmarket suburb of Beacon Hill is to be found the house where Louisa May Alcott lived. We had been shown the house in Louisburg Square on a previous visit to Boston, but this time we were unsure about which was the correct house. While Neil was trying to Google ‘Louisa May Alcott’ on his iPhone, a biking tour group stopped near us and we could hear the guide talking about the Square and how John Kerry (the American Secretary of State) lived there and “Louisa May Alcott, the children’s author, used to live at the third house from the corner”. 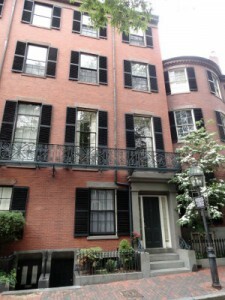 So the address is 6 Louisburg Square, if you should ever be in Boston and wish to see where the author of Little Women, Good Wives, etc., once lived. 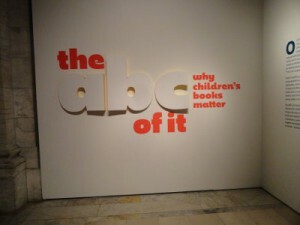 While we were in New York there was an exhibition in the New York Public Library entitled The abc of it: why children’s books matter. This well-designed exhibition began with very early books which children read and looking at how they were written to influence their readers. Political and social events in America also influenced what authors considered appropriate reading for young people. But gradually stories began to predominate. In a pre-television age story telling was a common pastime and some stories told in private found a wider audience, in particular Lewis Carroll’s Alice in Wonderland. 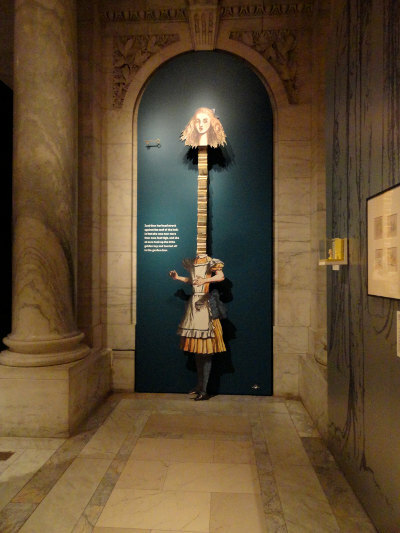 In the exhibition there was a wonderful larger than life size illustration of Alice where the top part of the picture moved so that Alice’s neck was normal size and then grew. Illustrations and picture books became important, and there were illustrations of Peter Rabbit and Madeline. The exhibition continued with many well-known children’s books (especially to an American audience) and authors like Beatrix Potter, A A Milne and later still J K Rowling.Later developments were influenced by the ready availability of cheap paper back ‘Dime novels’ and comics. The Harry Potter phenomenon was examined and also the influence of Superman comics, Mad Magazine, etc. 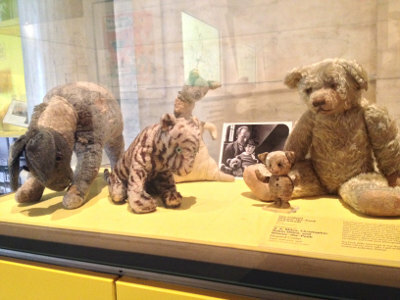 The exhibition drew from collections across the Library, and one of their highly prized possessions is Christopher Robin’s original toys which inspired the Winnie the Pooh books by A A Milne. Pooh, piglet, Eeyore and Kanga were all on display, with an explanation that Roo had been lost over the years. Christopher Robin’s original toys which inspired the Winnie the Pooh books by A A Milne. Pooh, piglet, Eeyore and Kanga were all on display, with an explanation that Roo had been lost over the years. Nicola Daly, our current research grant recipient, has made several visits to work on her project. It is always a pleasure to see books from the Dorothy Neal White Collection being used for in-depth research and we are very much looking forward to Nicola’s final research report at the 2015 AGM in May. I was very pleased to be able to show Jill Shefrin, our guest speaker at our October meeting (see p.7), around the Dorothy Neal White Collection. Jill spent two hours with me in the morning, so she had time to look more closely at the items that particularly interested her. That afternoon, Ruth Lightbourne showed Jill the Alexander Turnbull Library’s Special Printed Collections. I have been very busy over the past few months preparing an exhibition for the Turnbull Gallery. “A Child’s War” opened on 24 November and explores the impact of World War I on the lives of New Zealand children. The exhibition draws on several Turnbull Library collections and includes manuscripts, photographs and ephemera as well as published material. A significant part of the show is made up of wartime children’s literature from the Dorothy Neal White Collection. For more about the exhibition see p.7. The current display cabinet offering is a selection of nursery rhymes and Mother Goose collections. Nursery rhymes have a long history, and thrived as part of the oral tradition for many years before finding their way into the printed book. Many of them did not start out as children’s rhymes at all, originating as ballads, folk songs, or street plays. Committee member Audrey Cooper has not been well recently. Very best wishes Audrey from the committee and your many friends. The Society launched Number 12 in the series Notes-Books-Authors recently, a forty-page booklet by Trevor Mowbray entitled The Nineteen-Forties: a Turning Point in Writing for Children . This is the text of a talk Trevor gave to the Society in 2011 about the boundary between the Dorothy Neal White Collection and the National Children’s Collection. As the School Library Service began buying books in the nineteen forties that date was decided as the beginning point of the National Children’s Collection. Trevor had done a research paper when he was employed by the National Library on the significant titles of the Forties to see what was involved and that formed the basis of this essay. The scope had widened however to include not just titles in the National Library collections but also other books by authors who were popular with children at that time such as Richmal Crompton, the author of the “William” books, Enid Blyton and Helen Dore Boylston. Some mention also had to be made of the many film and radio series that originated in the time such as the “Lassie” stories. The very small number of New Zealand publications are recorded while the bulk of the titles came from America and England. Picture books flourished at that time and many have become all-time classics. 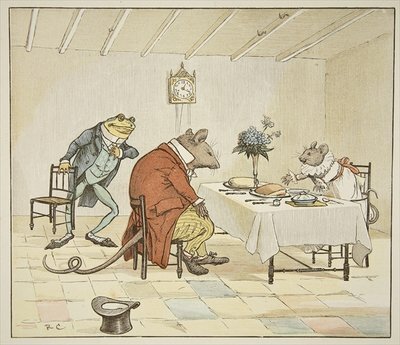 Children’s family stories and animal and school stories were all developing and starting to break away from the very middle class, unrealistic tales of the thirties. The ground was being prepared for the burst of vigorous writing for children in the Fifties and Sixties. New genres of science fiction and career fiction were just beginning. You will enjoy going back to see if you can recall the favourites of your childhood. N-B-A 12 was launched at the Friends event in October by writer, librarian and advocate for children’s literature, Barbara Murison. She welcomed this survey on writing for children published in the 1940s and was delighted to see listed many of her own favourites. She entertained the audience with the memory of locking her grandmother in the pantry. Barbara was not at all bothered by the punishment of not being allowed to visit her grandmother again, but very upset that this meant she would no longer have access to the Just William books! On October 28 we were very fortunate to have the opportunity to host the Canadian academic Jill Shefrin. Her topic To excite their attention with images and pictures; printed pictures in formal and informal education of children in the long eighteenth century was fascinating and illustrated with some very engaging images. Looking at the period from about 1660 to 1820 Jill has explored newspaper advertisements, ephemera, diary entries, letters, and games, as well as the artefacts themselves to discover many examples of pictures used to ’instruct and delight’. This exhibition explores the affect that the Great War had on the children of New Zealand. Curator Mary Skarott uses material from across the collection to illustrate how, although children had no invading forces to fight, the adult world sought to win their hearts and hands to support and contribute to the war effort. Some New Zealand children’s reading during World War I did not go much beyond the School Journal and perhaps the newspaper. Others, though, read stories and informative books about the events of the war. The exhibition includes a selection of children’s books from the Dorothy Neal White Collection that were published during World War I.
Bookplate in the copy in the DNW Collection “Awarded to Charlie Oliver, 1918”Mary will be giving tours of the exhibition as part of the Friend’s end-of-the-year event on 2 December 2014, and will give a presentation about books about WWI that are currently being published for children at the first meeting in 2015 (Thursday 17 February 2015, 5:30pm). 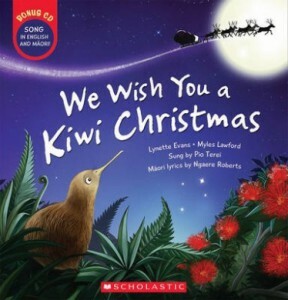 Every year brings a few children’s Christmas books adding a New Zealand flavour to old themes. This year we have a bi-lingual play on “We wish you a merry Christmas”. This is a wonderfully colourful book by Lynette Evans with illustrations by Myles Lawford. Easily sung to the favourite Christmas tune in both English and Te Reo Māori, the words have been adapted to include some of our native birds in this story of how they help Santa to find his way again after a crash landing. In addition there is a CD in both Māori and English at the back of the book. This is sung by Pio Terei with the Māori lyrics by Ngaere Roberts. Backing vocals are by Marian Burns and the singers from Marina View School, Auckland. Lynette has written many children’s books, fiction and non-fiction, about New Zealand and international wildlife. Myles has illustrated number of titles for Scholastic, including The 12 Days of Kiwi Christmas, Doggy Ditties and The Letterbox Cat. Entertainer, Pio Terei is the well-known New Zealand presenter of ‘The parenting show’ and enhances this book with the vocals in the CD. A lovely interactive book for the younger reader, with added encouragement to explore the bi-lingual lyrics in a sing-along version. It was a shock when I learned of the death of Carrick Lewis. Carrick, with his wife Norrina, had been keen members of the Friends, regularly attending events, including the 2014 AGM in June. At every annual general meeting Carrick could be counted on to recognise the work of the committee and also to contribute to the discussion – and so it was this year. We missed him at our October event, but it was not until his memorial service, held a Lychgate Chapel on 6 November 2014 that I learned that he had been ill for some months. Although Carrick never served on the FDNW committee he was involved in many other organisations, both local and national, and on the executives of several. He had a strong interest in politics and the environment, as well as in the arts and education. Among the organisations in which he had an active interest were the NZ-USSR Society (Wellington branch), the Humanist Society of New Zealand, Grey Power (Wellington Central), the Victoria University Club and the National Library Society (NZ). He was also a former president, and an honorary life member of the United Nations Association of New Zealand, an active member of the New Zealand Labour Party, and a PSA secretary-organiser. Carrick is survived by his wife Norrina, and his brothers Martin and Eric, both of whom spoke at his funeral. We will miss Carrick’s involvement with the Society, and we offer our condolences to them and to Carrick’s many friends and extended family. ’Noël Coward talked about the potency of “cheap music”. Well. I’m a great believer in the potency of “cheap literature”,’ Mary Cadogan once said. Mary Cadogan, who has died aged 86, was a literary historian, chronicling the history of children’s books, romantic and detective fiction and many other aspects of the popular culture of the last two centuries. A writer, critic and broadcaster, she was a passionate advocate for the pleasures of times past, who delighted in passing on her love of writers and their work, as if sitting beside the reader and sharing some much-thumbed book or comic that had amused her, thrilled her or caught and excited her imagination. Cadogan’s literary career was triggered by a chance meeting in the mid-70s with the Belfast-born writer Patricia Craig, with whom she shared an interest in the school-story genre. This resulted, in 1976, in their collaborating on You’re a brick, Angela!, a review of girls’ books between 1839 and 1975, spanning a wide spectrum of writings, from the moral and improving tales of the Victorians, via school adventures and comic papers, to the novels of Joan Aiken, Nina Bawden and others. Thoroughly researched, filled with sharp observations and, above all, wittily written, the book garnered wide critical praise and swiftly became (and has remained) a standard text. Cadogan had found her metier and her personal reputation was secured with biographies of two authors responsible for much-loved characters from children’s fiction: Richmal Crompton: The woman behind William (1986) and Frank Richards: The Chap Behind the Chums (1988). 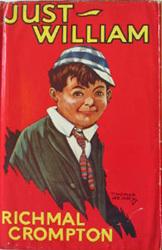 She would return to the disaster-prone William and his Outlaws in The William companion (1990) and Just William through the ages (1994) and to Billy Bunter, the Owl of the Remove, and his fellow students at Greyfriars school, in a series of publications in collaboration with John Wernham and Tommy Keen, devoted to the characters and stories in the prolific canon of Charles Hamilton and his alter ego, Frank Richards. Other successful titles included Chin Up, Chest Out, Jemima! : A Celebration of the Schoolgirls’ Story (1989), Women With Wings: Female Flyers in Fact and Fiction (1992), And Then Their Hearts Stood Still: An Exuberant Look at Romantic Fiction Past and Present (1994) and in 2008, the year of her 80th birthday, Mary Carries On: Reflections on Some Favourite Girls’ Stories. 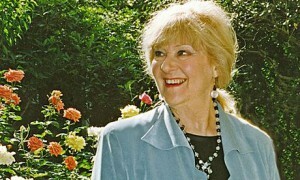 Her affection for the picture-strip adventures of Rupert Bear, created by Mary Tourtel for the Daily Express, inspired Rupert and the Women in his World (2006), while admiration for Enid Blyton led to a collaboration with Norman Wright on two treasuries of Blyton adventure and school stories. Cadogan was a regular reviewer for the Birmingham Post for almost two decades and contributed reviews and features to many national papers and magazines. For a more specialist readership, she edited the Story Paper Collectors’ Digest (1987-2008) and acted as co-editor of the Just William Society Magazine (1995-2003). Born in Ealing, west London, she was the daughter of Thomas Summersby, a policeman, and his wife Ivy, a nurse. The family later moved to Kent, where Mary was educated at Bromley county grammar school for girls, matriculating in 1944. Her youthful reading would have an impact on her later writing career, as she noted: “I used to devour the Magnet and the Schoolgirl avidly in the 1930s … at the same time as I was devouring the works of Jane Austen, Charlotte Brontë and Anna Sewell. It never struck me then, or now, that there was anything fundamentally in opposition about these two types of reading.” She said that there was a often a weekly scramble to get her hands on her brother Tom’s copy of the Magnet before he could read the comic himself. She began her working life as programme secretary for the BBC’s variety and, later, schools broadcasting departments. In the former she encountered many well-known entertainers of the day, including Tommy Handley and Arthur Askey, while others – among them Frank Muir and Arthur Marshall – became and remained friends. She subsequently trained in music and dance therapy for young polio victims and worked as secretary to the welfare committee of the Infantile Paralysis Fellowship (now British Polio Fellowship). It was in their offices that she met one of her literary heroines, Crompton, a keen supporter of the charity and herself a polio sufferer, though she never plucked up the courage to question Crompton about her famous literary creation, William Brown. In 1950 she married Alexander Cadogan, an engineer. They began attending talks by the Indian writer and teacher Jiddu Krishnamurti, a man she once described as being ’the great spiritual force of the 20th century”. From 1958 until her death, she worked for the Krishnamurti organisations in England as the first company secretary of the Krishnamurti Foundation, 1968-1995, and subsequently as a governor of the foundation and its international school at Brockwood Park in Hampshire. She also chaired the foundation’s publications committee and edited several of Krishnamurti’s books, including two volumes of his dialogues with the theoretical physicist Professor David Bohm. Cadogan was a recipient of the Silver Cross of St George award from This England magazine, a lifetime achievement award from the Children’s Books History Society and, in 2009, received an honorary doctorate of letters from Lancaster University for having “enriched the store of human knowledge and added to the sum of human happiness”. She is survived by Alexander and their daughter, Teresa; and by her brother Tom. • This article was amended on 9 October 2014. The original stated that You’re a Brick, Angela!, published in 1976, was a review of girls’ books between 1839 and 1985. In fact, the first edition of You’re a Brick, Angela! included titles published up to 1975, and a later edition took in the following decade. This has been corrected. The annual membership subscription for the Friends of the Dorothy Neal White Collection is $20. Members might also like to make a contribution to a special Research Grant fund that will allow us to continue and / or increase the amount we are able to offer a student doing research based on the collections supported by the Friends. A separate line has been included on the form for those Friends who would like to make such a donation. If you prefer to pay by internet banking then this is encouraged. Please include your name as reference.